Amici recently released a new set of dishes carefully conceptualized by Executive Chef Paolo Moran, who spent a year working in restaurant kitchens in Florence and Sicily to gather inspiration. He is the creative mind behind five new, delicious dishes that aims to give lovers of Italian cuisine a taste of authentic Italy. 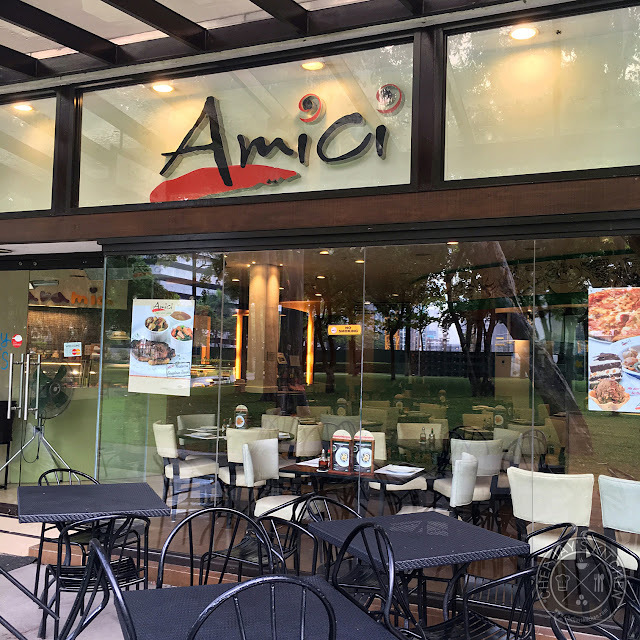 For those of you who are not familiar with the history, Amici started out as a cafeteria in Don Bosco, Makati in 2001 and was the brainchild of a priest, Fr. Colombo, who introduced Italian coffee and gelato, wood-fire baked pizza, and homemade pasta. This turo-turo style Italian dishes became very popular and customers from all over the Metro came to Don Bosco for authentic and homey Italian dishes. From such a humble beginning, Amici now has 10 outlets and counting all around Metro Manila. 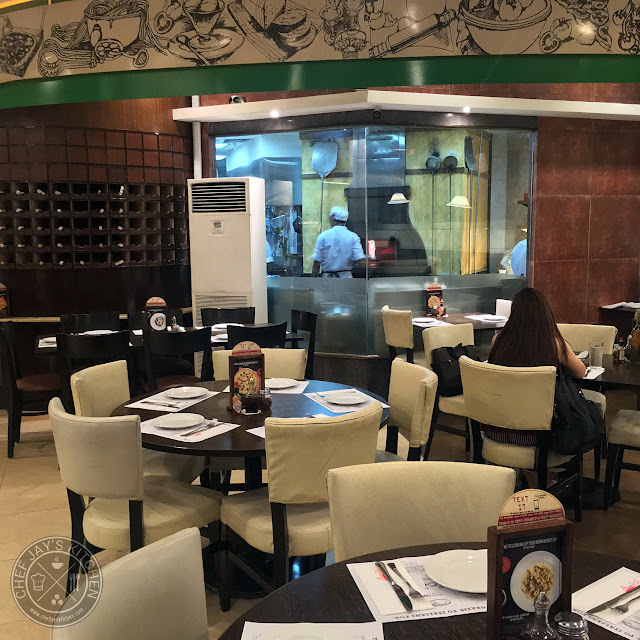 The restaurant at the Ayala Triangle Gardens maintains rustic Italian interiors and an open kitchen where you can see all the dishes being made. It has comfortable seats surrounding round tables so that you can easily converse with one another and couches for more intimate conversations. 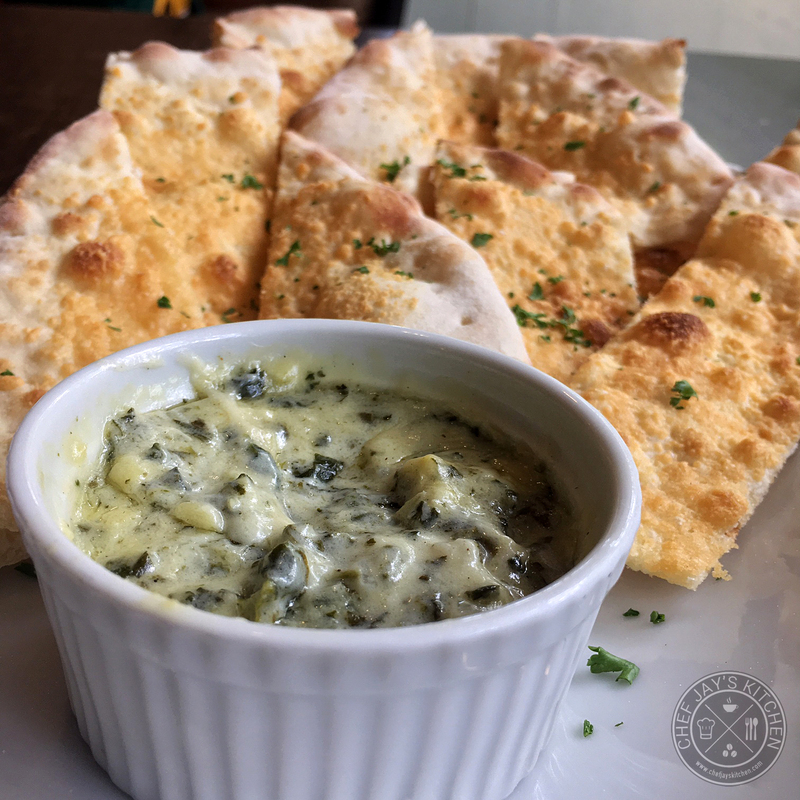 The Spinach Artichoke (Php 285) might not a a new dish, but it's definitely an Amici favorite! I love the creamy and flavorful spinach artichoke dip and it matches quite well with the parmesan coated pizza crust wedges. It's a nice appetizer that helps get your palate going to start the meal. If you're looking to enjoy a hot cup of Italian coffee in the afternoon, it's a great dish to order along with some pizza for a nice snack. 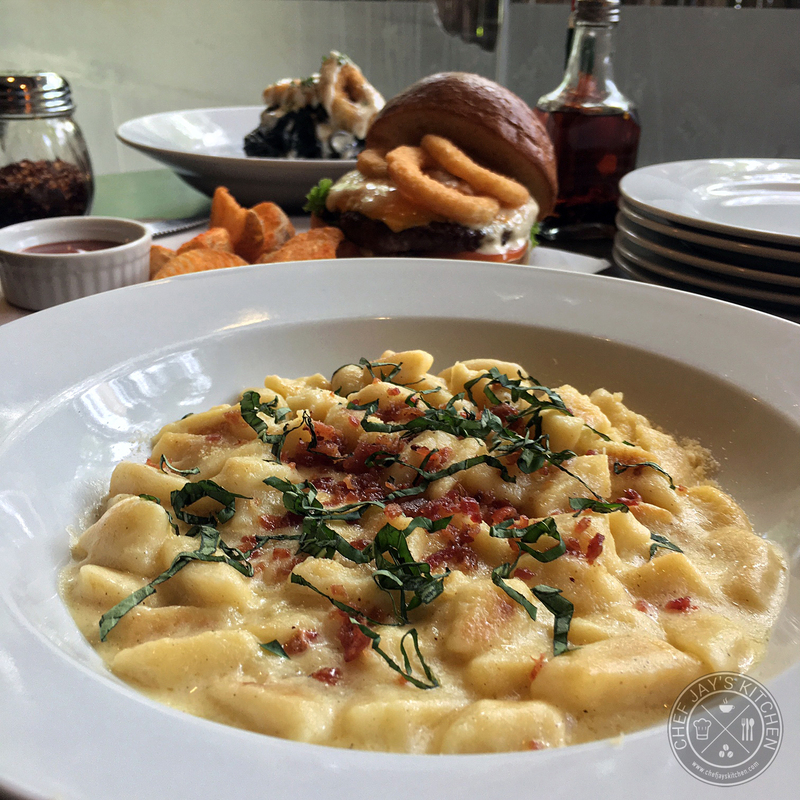 The Bacon & Cheese Gnocchi (Php 368) is my favorite dish from the new Amici Menu and it's not hard to understand why. These pillows of joy are homemade and is a plate of cheesy goodness. I love the soft, fluffy texture of the gnocchi coated with that rich cheese sauce made of asiago and parmesan. The saltiness of the bacon on top helps cut through some of that riches and gives added depth of flavor in each bite. If there is one thing in the new menu I would recommend you should try, it's this dish! 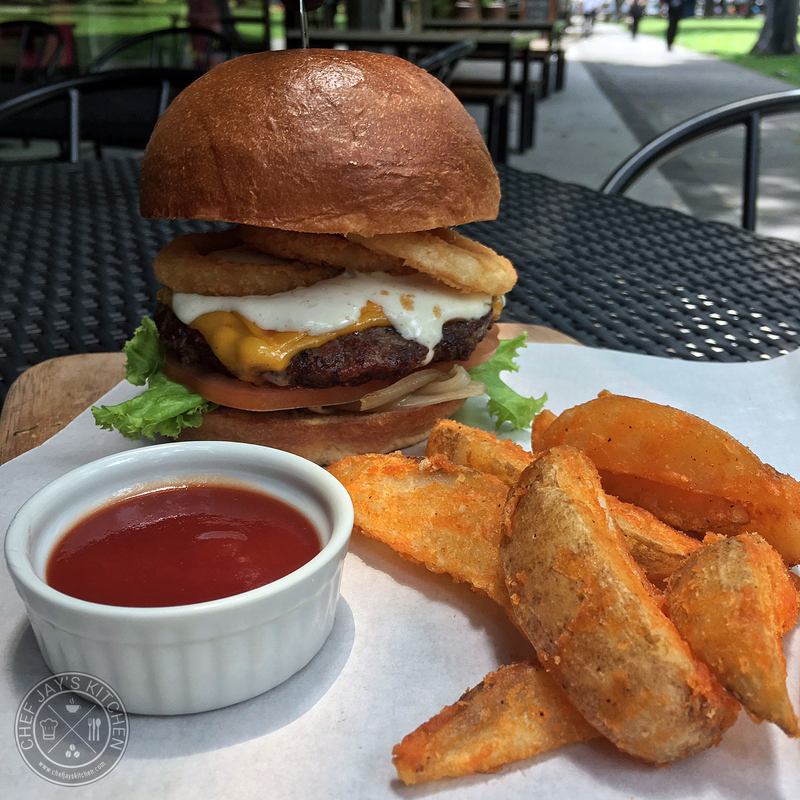 The Italian Burger (Php 368) consists of an Italian sausage beef patty that's seasoned Italian-style, topped with deep friend onion rings, cheddar cheese, lettuce, and tomatoes in between two butter toasted brioche buns. It's definitely an interesting concept because you don't get a lot of Italian burgers around and it's a good dish to try if you're looking to try a unique burger. The Italian flavors are definitely there, but I'm not quite sure I'd order a burger in an Italian restaurant. 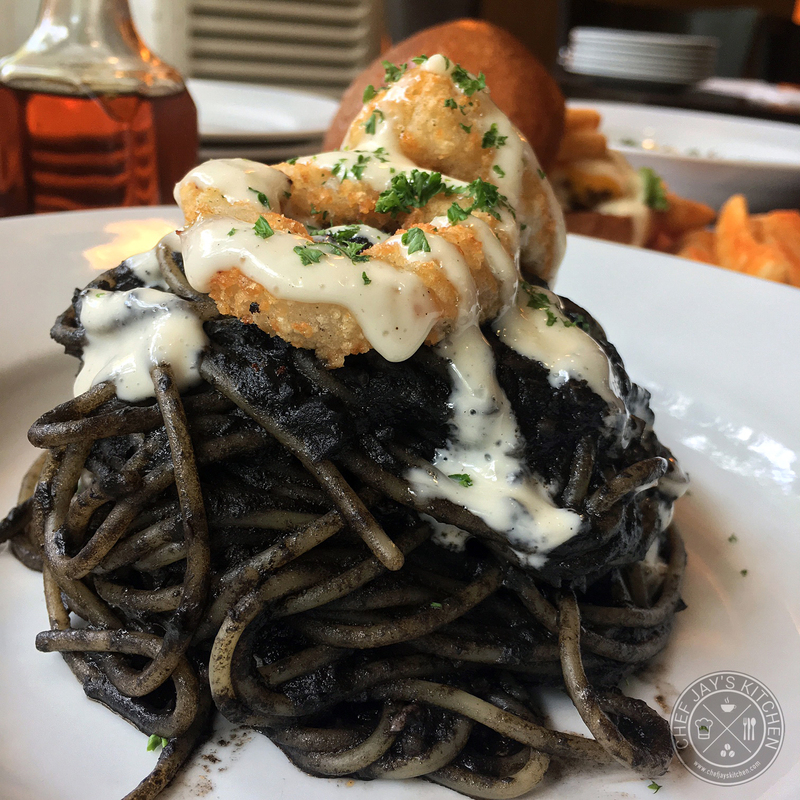 The Pasta Nero (Php 398) is Amici's take on the squid ink pasta. What makes this one unique is that it's actually blended with pomodoro sauce and is drizzled with garlic aoli that adds a garlicky kick to the dish. Overall, the pomodoro sauce helps remove the 'malansa' taste from squid ink but also makes this a bit sweeter compared to most of the squid ink pasta around. It's a good dish and it's tasty when eaten with that crunchy calamari on top. 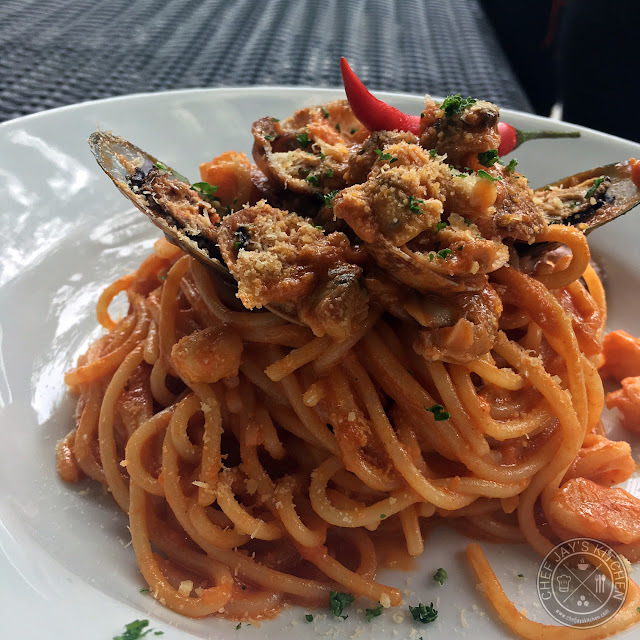 The Seafood Diablo (Php 378) is perfect for those of you who love seafood and spicy things. It's a tomato-based pasta dish that's sauteed with chili flakes and chili oil and topped with clams and scallops. Personally, I loved the taste of the clams and scallops paired with the spiciness of the sauce. Of the two pasta dishes, this is the one I would definitely come back for. I honestly thought it wasn't as spicy as the term 'diablo' suggests, which is a good thing because I'm not that crazy for spicy dishes. The Spicy Italian Sausage Pizza (Php 468) is a wood-fire oven cooked pizza topped with Spicy Italian sausage, Asiago cheese, mozarella, cream, and caramelized onions. This is actually a dish I would call spicy hot but I also find it very delicious. 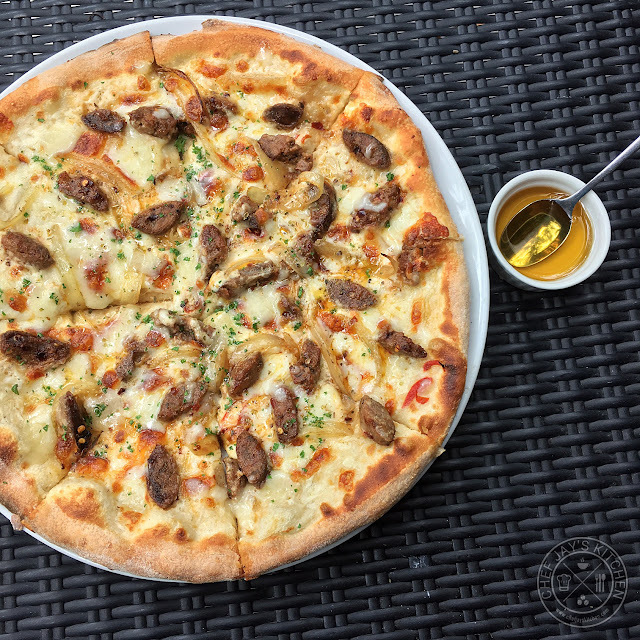 I love all the spice and flavor that goes into this dish and the side serving of honey that you drizzle all over the pizza helps cut through some of that spiciness. In terms of complexity of flavor and the sweet and spicy balance from this dish, I have to say I love it. I really recommend you try it! The Bistecca Striploin Steak (Php 795) is probably the best dish I tried from Amici. It's cooked to perfection as the beef was tender and succulent and is just perfect with the baked potatoes. I loved every bite of it and I would highly recommend it if you're looking to enjoy quality steak. I was honestly quite surprised to find that Amici cooks steak this well. It's also quite affordable (for steak) so it's really one highly recommended dish. Finish your meal with a delicious Matcha Gelato (Php 90), a new ice cream flavor by Caramia. 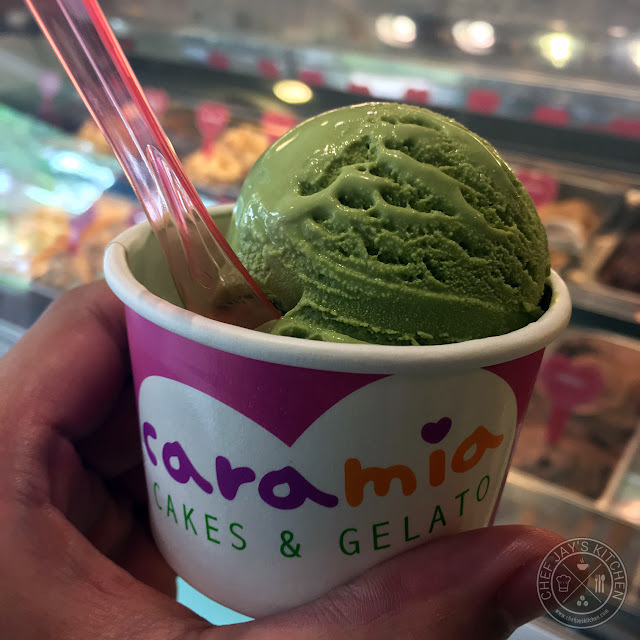 It's a nice, sweet take on this Japanese favorite. 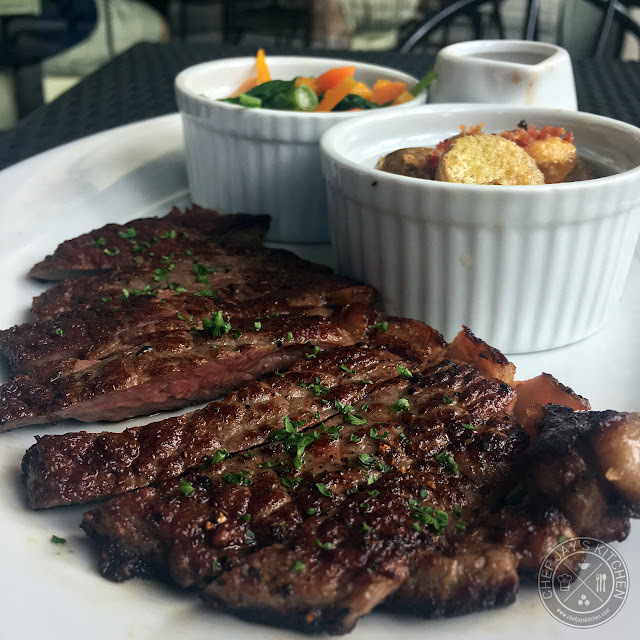 Amici might be an old favorite when it comes to Italian cuisine in Metro Manila, but they still continue to innovate by introducing new dishes that might form part of their menu moving forward. Out of the new dishes they introduced, I really loved the Bacon & Cheese Gnocchi, the Spicy Italian Sausage Pizza, and the Seafood Diablo and I hope that these three dishes will be a regular part of their menu moving forward. Hats of to Chef Paolo Moran for a delicious Italian feast. I hope you guys try out these awesome new dishes!